It’s that time of year again when I take all of last seasons observations and time out on the trail and funnel those experience into the next round of prototypes. 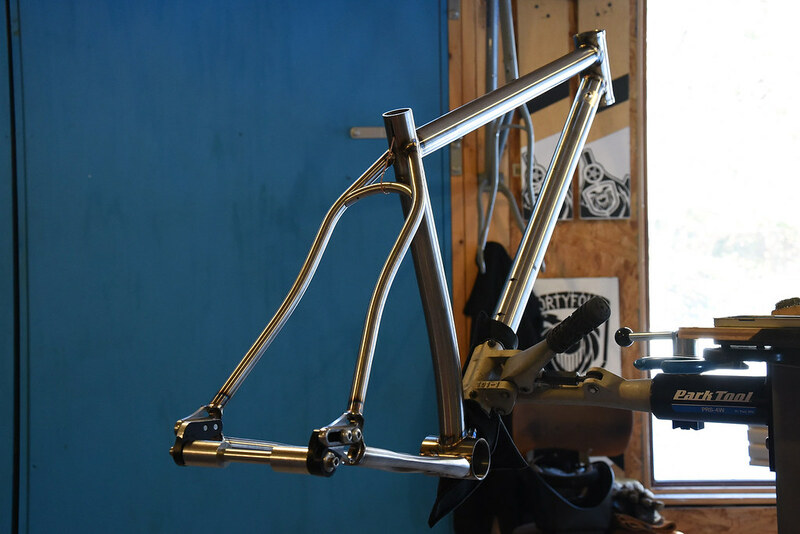 I have one steel build planned as well as 2-3 Titanium mountain bike prototypes planned. Why so many? Well, I’d like to try a few subtle changes out mostly fiddling with some drivetrain and dropout spacing but also fiddle with wheelbase a bit. I feel as though I’ve pushed the geometry to a point where I know the working range of what performs in different terrains pretty well but now I’d like to make subtle adjustments to other details to see how those affect the geometry decisions if they are a constant. What I’ve found is if you make too many changes all at once, you can’t necessarily pinpoint exactly where the root of any problems may be because there are too many factors to juggle. So it’s important to take handling characteristics in isolation while other factors remain constant that I know to be working. 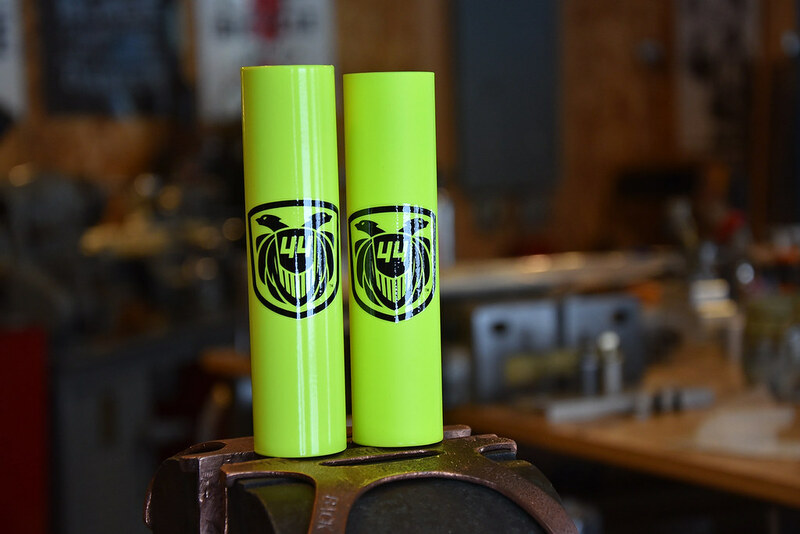 · Cane Creek 110 HS or White Industries HS… still thinking on that one. · ENVE Mtn. Risers… Uncut. That’s it in a nutshell. 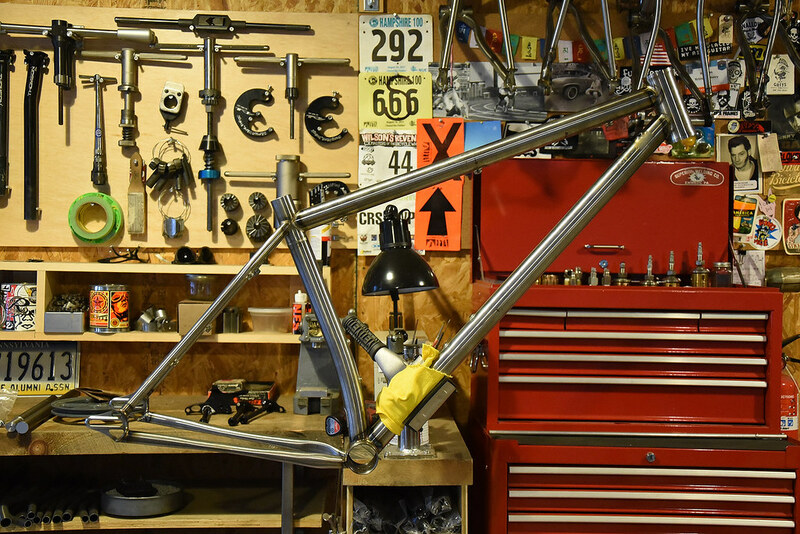 The build is a longer top tube/short stem set up. I’m very curious about just how much stem to top tube mix is required for our terrain here in NH and on the East Coast at large. For the uninformed, it’s rocky, rooty tight and technical. There’s climbing in there too but it tends to be short and steep. Descents vary but because the singletrack is very tight and tends to be on the twisty side, I need a bike that’s still nimble and has snap. Too long of a wheelbase really slows that down. 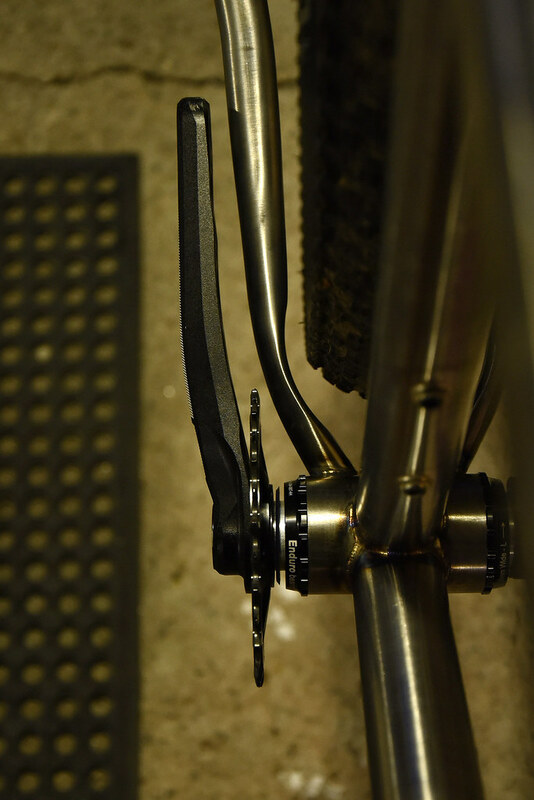 Basically, for every 10mm of stem length I subtract, the front wheel moves forward about .5″. So what’s the optimum mix of a few factors so the bike still performs well when the singletrack is tight, twisty and techy vs when it’s headed downhill? I have a hunch but where this is all going is with this new build I’ll be able to test out some theories and further push the performance of my bikes so they’re well balanced for all conditions. The other factor is I’ll also gain vital feedback so if a client really wants a bike to perform for a very specific set of parameters, I’ll be better informed as to what kind of mix of geometry to use. As far as build spec for the terrain around here in NH, 11 speed has just what I need! Technically speaking, 12 speed is heavier (Sram Eagle). Weight is the last consideration on my list, but with so many options it’s still an important factor to consider. What’s nice about Sram’s Eagle is for those out there with A LOT of climbing, we finally have a 1x option that allows us to run a 34-36t chainring but has a really wide range cassette so you’re not really making many compromises on the high and low end of the spectrum. However, like I mentioned earlier, 11 speed is all I need for the terrain here in NH. 12 speed is a bit overkill. I can go either way on a 40t or 42t cassette but I’ve found if I run a 30t up front, I find myself more in the center of the cassette the majority of the ride so the 40t is right at home here in NH. And that means less chain crossover which means less wear on the system. For me and a 30t x 11-40t, I lose some speed on the flats but then again the flats are typically dirt road connections and I’m resting. Although I don’t feel like I’m slow or not going fast enough. I “might” run Eagle on my next Fat Bike build. We shall see if the snow and winters continue to be so hectic. This build sports a 157mm spaced rear end but I’ve built the frame using a 74mm T47 bottom bracket shell. Why not an 83mm shell? First I needed a bit extra room inside the bottom bracket because the dropper routing is inside the down tube and exits through the bottom of the bottom bracket shell. So T47 was a must. However, I would have needed to turn a new bb heat sync for a T47x84mm shell. That’s not a problem but I had some questions from clients about retaining their existing crank stance. Since I’m using a Race Face Cinch crankset, I can flip the ring to achieve proper chain line for the 157mm spaced rear end. So any pushback from potential clients regarding crank tread aka “q-factor” who like the idea of a wider/stiffer rear end but don’t want to jump up to that wider crank stance, this was an opportunity to test out how this may all work. The result is that the bike has an AMAZING amount of tire clearance and chainring to chainstay clearance with a simple flip of the ring with a ZERO dish rear wheel. Spoke lengths of that 157mm rear hub are identical and it’s a hub that can take gears. And run that with a “normal” pair of cranks? There’s some winning going on in there. On a related but separate note, White Industries made a recent running change to their M30 cranks so their rings can be flipped as well. I’m pretty excited about that running change because White’s cranks are pretty darn sweet! But for now, I’ll be running a set of Race Face Turbine Cinches. Matte on the right, gloss on the left. Matte for the win! I’m also debating what the pop color is going to be as the rest of the components will be on the ALL black spectrum. My go-to color in the ’90’s was turquoise. Purple has stood the test of time and White Industries does have a nice purple headset. Shoog’s Huntsman SS sported purple… But again, this is the re-envisioned trusty Trek Antelope 830 of years gone by reborn as a Marauder. I pick the frame up from powder next week. I can’t wait! I’ll be sure to share build shots in all the usual places. It should be a good build to test and a nice homage to that first mountain bike that took me just about everywhere.